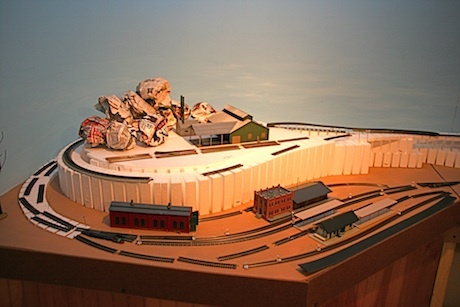 The Blue Ridge and Southern model railroad backdrop was developed out of need and convenience. It may not be the best way for everyone to do it but it worked for me. My layout room is like most model train rooms. It has corners. Corners are very unrealistic in model railroading. If you see a picture of a model railroad with beautiful scenery that has a corner in the backdrop, the realism is immediately gone. Not that the railroad can't still be admired for what the modeler has achieved on the surface. Nevertheless, the effect is detrimental to the look of the whole railroad. So the first thing I wanted to do was to have rounded corners. Most model railroaders use thin sheets of hardboard mounted in such a way as to round the corners of the layout so the corners are no longer visible. Hardboard is probably the best material to use for this because it is durable, paintable and you can use spackling compound to cover the seal between each section of the hardboard. In my case, I had a lot of sheets of extruded foam left over after I used what I needed for my subroadbed. Not wanting to waste this, I thought maybe it would work for my model railroad backdrop. It was easy to cut and very bendable and the seal between the sheets didn't leave much of a gap. And I thought if it doesn't work, I can always replace it later with hardboard. Of course I knew that would be difficult to do after the layout was completed but probably still doable. So I measured and cut the foam sheets with a long-bladed hobby knife. I attached them to the wall using white glue starting with the left corner of my layout. Amazingly, it seemed to work fairly well. The sheet rounded the corner nicely, didn't break in the middle, and made a fairly small seam with the next sheet. I continued gluing the sheets to the wall all around the room rounding out the other 2 corners of the layout without difficulty. I then used spackling compound to fill in and cover the seams so they wouldn't be visible at all. I let this dry, then sanded down the rough spots being careful not to rough up the foam too much. Painting the backdrop was fairly easy as well. I opened 2 cans of paint: one white and the other sky-blue. Working on one section at a time, using a roller, I started at the top of the backdrop and painted it blue about halfway down. Then for the bottom, while the top was still wet, I started mixing in a little white paint to the blue in the roller pan - not completely mixing it in. I used a brush to blend in the blue on the top with the blue and white on the bottom adding even more white as I got closer to the bottom (because the sky in the horizon is usually a little lighter than the sky above the horizon). Since the white and blue were not completely mixed together, I was able to get a white streaking effect to look like wisps of clouds on the horizon. I knew this would be about as far as I could go with my limited artistic ability in making my backdrop look realistic. If I tried to paint mountains or trees or any other scenery, it would never look right. If you're an artist and good at painting landscapes, this is where your artistic side could really shine and could really enhance the layout tremendously. I knew my limitations however and did not attempt to do this. What I might do in the future is get some of my old photographs of autumn scenery in the Blue Ridge Mountains, take them into a camera shop and get them blown up and seamed together into something that looks like a model railroad backdrop. Or, even better, I should take another trip to the mountains in the fall and take more pictures using a camera with panoramic capability and retake some of those pictures, have them blown up and use them. The other option - the lazier and more expensive one - would be to buy the model railroad backdrops that are made and sold for that purpose. They are a little difficult to find with Blue Ridge type autumn scenery, but not impossible. That would probably look the best. However, it's a little like using someone else's art as part of your painting. It's a small thing though, and I might do it anyway in the future if I get tired of looking at a plain sky with wisps of clouds. After the layout is completed scenery-wise, adding a backdrop like that would be a rather dramatic enhancement I'm sure. 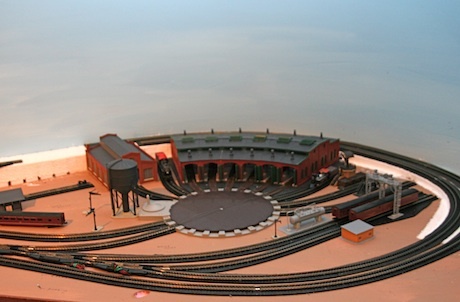 From "Model Railroad Backdrop" to "Blue Ridge & Southern"
From "Model Railroad Backdrop" to "HomePage"